Sometimes we don’t even know we’re doing it. The key to spending your time efficiently at work—or within any pursuit for that matter—is becoming aware of how you’re spending your time, trimming the proverbial fat, and focusing on the things that really matter. 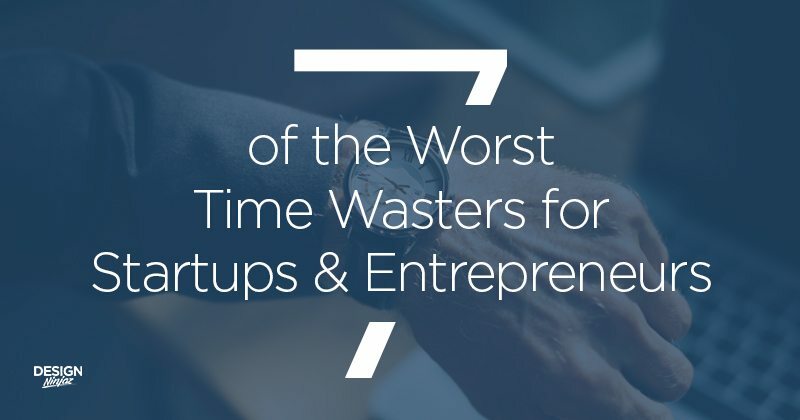 In this post, we’ll examine seven-time wasters that plague startups, entrepreneurs, and small business owners. Once you become aware that a certain activity isn’t contributing to your goals, you can remove or phase it out of your routine. Or, better yet, outsource it to someone else so that you can spend your time doing what you do best: running your business. Let’s just get this out of the way, because we all know it was coming: social media is a huge time waster. As a digitally savvy business owner, there’s a pretty good chance that you’re on all the major social media platforms. Facebook and Twitter are common, and more and more businesses are starting a presence on other platforms like Instagram and even Snapchat. The list could be quite a bit longer depending on your goals and industry. Social media is a powerful way to promote your business and interact with your target audience. However, it’s easy to let things get out of control in terms of how much time these platforms are taking out of your day-to-day activities (especially if you’re in the habit of checking your personal accounts too, even if it’s “just for a moment”). The solution is to limit yourself to work-related tasks only. Leave the memes and personal interactions for later in the day. If you’re a business owner with a driven personality type, it probably does to at least some extent. Or to a huge extent for some of us. But let’s be realistic here: the fact of the matter is, nobody has ever built a business empire with that as their motto. Micromanagement is a business performance-killer. Learning which tasks to delegate and which to handle yourself is a skill that one doesn’t learn overnight—more than a handful of books have been written about the topic, not to mention websites, blogs, businesses, and consulting agencies—but it is a skill that does have to be developed if you want to reach mogul status. 1.) The employee or subcontractor doesn’t have the skills or experience necessary to complete the task. If this is the case, you have to either provide them with training or replace them with more competent personnel. 2.) You just can’t manage to “let go” and allow your subordinates to work autonomously. If you’re stuck in scenario two, you have to realize that by not allowing your employees to do what you hired them to do /on their own/ is actually hampering the growth of your business. Read books on management or take a course on the topic pronto. Exercising the willpower to not procrastinate is a learned skill. It’s even a bit like exercise, because it takes practice. We like to refer to this as the “anti-procrastination muscle.” The more you work it out, the bigger and stronger it becomes. Just like anything in life, reducing the amount of time you spend procrastinating takes practice. Entrepreneurs and business owners know full well that without their input and work on a daily basis, their business won’t survive, and it certainly won’t thrive. Having total control over your own schedule and daily assignments is a liberating feeling, but it also requires the willpower to make what sometimes feel like tough decisions. Sure, you could sleep in or grab a round of golf, but is that even what you really want to be doing? When you train your anti-procrastination muscle, you slowly-but-surely get better at making the choices that you know are better for you and your business. As a result, you end up feeling better at the end of every day. There are so many different systems and methodologies designed to help you unlearn bad procrastination habits that it would be impossible to list them all here. Explore which ones work for you. Good starting places would be to learn more about the Pareto principle and the Pomodoro technique. Business owners and entrepreneurs are masters of facing down ambiguity, seeing the light at the end of the tunnel, and steering their metaphorical ship toward it. However, have you ever felt like there’s too much ambiguity in your day-to-day operations? You arrive at work knowing that you have to do something, but by the time the day is over you feel like you pretty much spent the entire time running from one end of the office to the other putting out fires? This could be an indication that there’s too much ambiguity in your workplace, your client interactions, or your overall business plan. If any of the things here felt a little too familiar for comfort, spend some time thinking about how you could concretize the most important actions that you need to take for your business to be successful… and then let nothing get in your way of accomplishing them. If you’re disorganized, there’s a pretty solid chance that you know it. Organization is such a huge component to spending your time efficiently that it’s practically a crime that it doesn’t get more attention. Some people believe that having a messy desk or workplace is an indication of success—since apparently you’re so busy making piles of money that you literally don’t have time to clean up—but in most cases it’s just a natural buildup that happens over time. At its core, the process of staying organized isn’t something that has a one time solution. For example, have you ever set out to clean your house or car, you spend an afternoon doing it, and it looks great… you know, for a while? A week or two later it’s back to being in disarray. This is actually quite normal. Once you get into the positive habit of maintaining your organizational systems, you’ll find that your efficiency is increased (perhaps by quite a lot) and that the amount of time you spend searching for things, documents, or other important elements of your business will be dramatically reduced. The concept of “information overload” is based around when you’re trying to learn a new skill or gain some kind of knowledge and you don’t give yourself time to digest what you’ve read, watched, or otherwise mentally absorbed so far. Successful business people tend to be obsessive types, and this is as much as strength as it is an occasional weakness. If you’re the type who wants to read every book about a certain topic before implementing it into your work life, you may have suffered from information overload in the past. Basically, you have so much new knowledge that you don’t know where to start applying it in your business. Learning new things is fantastic. We all have to do it, especially in today’s rapidly changing world. However, for that knowledge to bring benefit into your life, you need to give your brain time to process everything that you’ve given it. Burnout happens to the best of us. Most entrepreneurs have had to “pay their dues” and put in those grueling 60-plus hour workweeks, but at a certain point you have to slow down, take a moment to breathe, and reassess what you’re doing. Aside from potential health ramifications, overwork can actually reduce our efficiency. Without the right amount of downtime to give your brain and body the rest it needs, you’ll actually end up working slower, making more mistakes, and ultimately not accomplishing the amount of things you should be considering the amount of time you’re investing. Sometimes it’s important to wind down for a little while—learn when to recognize when you need a break. Managing our time is a skill that’s important to our Ninjaz, and we’d like to think that we’re pretty good at it by now. But this list serves as an important reminder, even to us! We’d love to learn more about how you avoid wasting time in your business, startup, or entrepreneurial pursuit. Let us know in the comments below or drop us a line on Facebook to share your own unique nuggets of wisdom. If you’d like to work with a professional team that genuinely wants to get to know you and understand your unique needs, feel free to reach out to us and we’ll put our Ninjaz on the job.